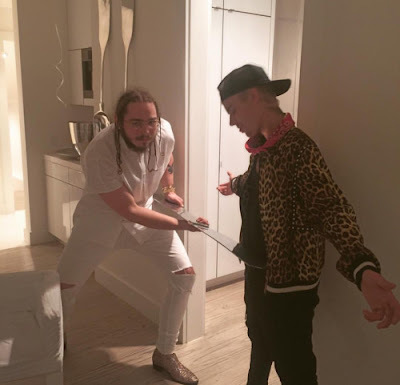 RAW HOLLYWOOD : POST MALONE CALLS ON JUSTIN BIEBER TO HELP WITH NEW SONG "DEJA VU"
POST MALONE CALLS ON JUSTIN BIEBER TO HELP WITH NEW SONG "DEJA VU"
"Tell me is that Deja Vu, cause you want me and I want you" is how the song goes as Justin Beiber and Post Malone sing on the hook of Malone's newest track "Deja Vu". The duo teamed up for this track after being on tour together and I'm sure there is more in store for the fans. Now I'm usually not into the singing rap, however, I like Post Malone's vibe. As a matter of fact, I'm still swaggin and saucin on people from his hit "White Iverson". As far as this new track, I can definitely see it being played in the clubs, at the end of the night. You know when its time to go and they start to slow it down a little, "Deja Vu" is the perfect song for that moment. It can also help create some love-in-the-club type of connections with Justin's sweet voice on the hook. Post Malone was supposed to release his album Stoney last month but things didn't go as planned and the artist ended up issuing an apology to the fans for the delay. We are currently still waiting on his album, but while we wait, take a listen to the "Deja Vu" below.